Up to 3,000 Swans fans can get into the north stand. Being a brand new stadium, facilities are top notch; expect great views and the amount of leg room you get at the Liberty. Food on offer includes cheeseburgers, hotdogs, a few varieties of pies, pasties, sausage rolls, Pizza Pods & Spicy Potato Wedges. Alcohol sold includes; Heineken, Strongbow, Guinness, Bulmers, Concrete Cow ‘Penny Popper’ or Pale Ale and wine. The down-side is it’s in the middle of nowhere; its miles from the centre of Milton Keynes. 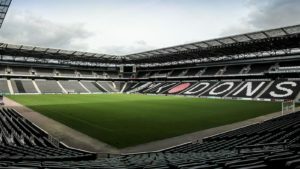 The famous Milton Keynes concrete cows have been immortalised in the mascot, a cow called Mooie, the South Stand is called the ‘cowshed’ and the locals have nicknamed the ground ‘The Moo Camp’. Milton Keynes is easy to get to if you’re close to the M1. Coming from South Wales, it’s a difficult cross-country trip. The grid system is hard to navigate with roundabout after roundabout after roundabout. Easy for the locals, because they’ve got used to it, but for a one-off visit it’s a nightmare. Hotels in the town centre are Mercure, Novotel, Holiday Inn Travelodge, Pemier Inn and Hilton, among others. Being a new town it has no history and sets itself up as a town to live in rather than a weekend or holiday destination. Places of interest are limited, and include Big Rock Climbing Centre (MK10 0AG), Snozone (MK9 3XS), for indoor skiing, Woburn Safari Park (MK17 9QN) and MK1 Shopping & Leisure Park (MK1 1ST). No pubs are near the stadium, although a KFC & McDonalds are close, plus a recently opened Odeon cinema that has several eating places out front. The retail park surrounding the stadium has Nando’s, Frankie & Benny’s, TGI Friday’s and Pizza Express The nearest pub is ‘Inn on the Lake’ (MK1 1PA), previously called the Beacon but doesn’t let in away fans. It’s a 25 minute walk into Bletchley, where there are a few pubs. The first that you will come to is the ‘Enigma Tavern’ (MK2 2EN). Fenny Stratford is a village a mile away and has a number of pubs close together, one of which is the ‘Foundry Arms’ (MK2 2NQ) with a fish and chip shop nearby. Another is The Red Lion (MK1 1BY) In Milton Keynes, there are a few pubs near the main shopping centre, and close from the train station. Coming out of the station you go straight up Midsummer Boulevard in front of you, after five minutes walk you’ll find ‘Wetherspoons’ (MK9 1EA). Further up the road are other Wetherspoon pubs, the ‘Secklow Hundred’ (MK9 1EB), and ‘The Moon Under Water’ (MK9 3NN). There are 2,000 car parking spaces at the stadium (£7) or park in the Denbigh West industrial estate. Almost opposite the stadium entrance is a small industrial estate, called Granby (entrance on Peverel Drive); some street parking to be had in this area. Near to the main road on Peverel Drive there is Magnet Trade (MK1 1NN), parking is £5, donated to a local charity. At the top of Peverel Drive an Islamic Centre offers secure car parking at £6. The nearest main station is Bletchley, 2 miles away served by trains from Euston & Birmingham New Street. More likely you’ll come in at Milton Keynes Central, 4 miles away. Taxi rank outside the station (£10) or there is the Arriva Service No 1, it’s hourly on midweek evenings. Also, you can also catch the Number 6 bus to the every 20 minutes and hourly back after the game. Trains from Swansea to Bletchley take 5 hours and are at 10:28, 11:28, 12:28 and 13:28. No trains come back to Swansea that evening after the game.